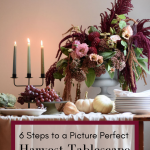 Six steps to an Instagram-worthy harvest table using everyday items. 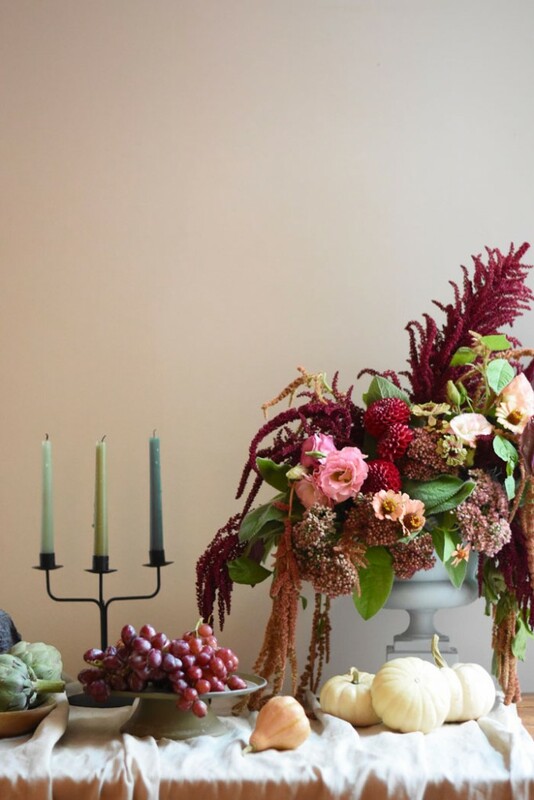 Pumpkins, candle light and a fall floral arrangement that reflects the bounty of the harvest season combine for the perfect backdrop to gatherings with family and friends this season. There’s something so welcoming about an autumn harvest table set with pumpkins, garden vegetables and the warm glow of candles. 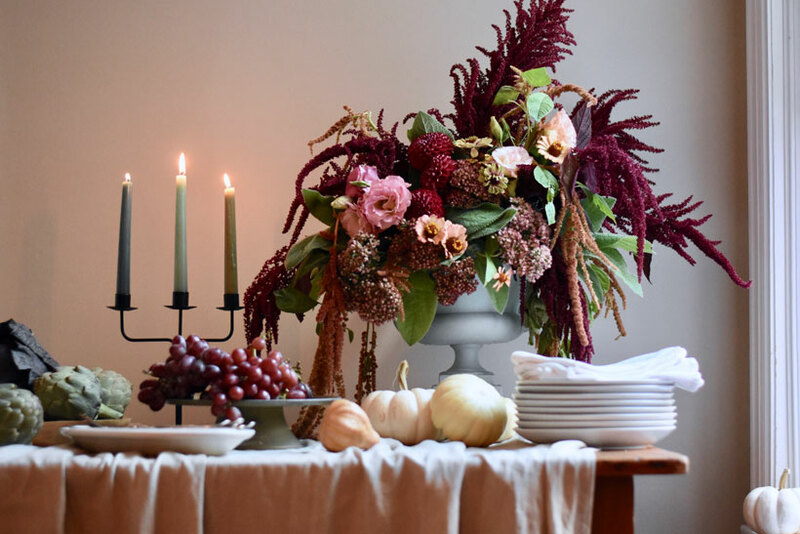 Using the season’s beautiful bounty as inspiration to decorate the table and celebrate its role as an important gathering spot is a tradition many of us love. 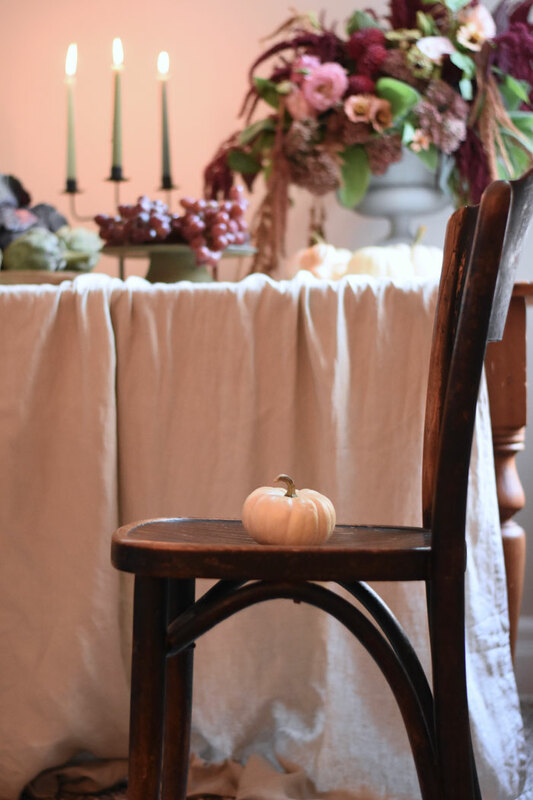 Here are my tips with step-by-step directions for setting fall table decor like a pro. Inspired? 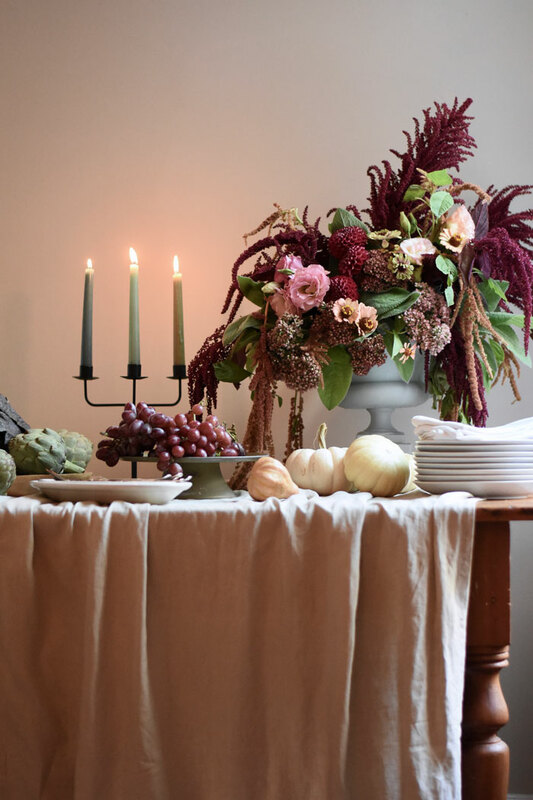 Share your your harvest tablescapes on Instagram using #romantichomes for a chance to have your photo featured! 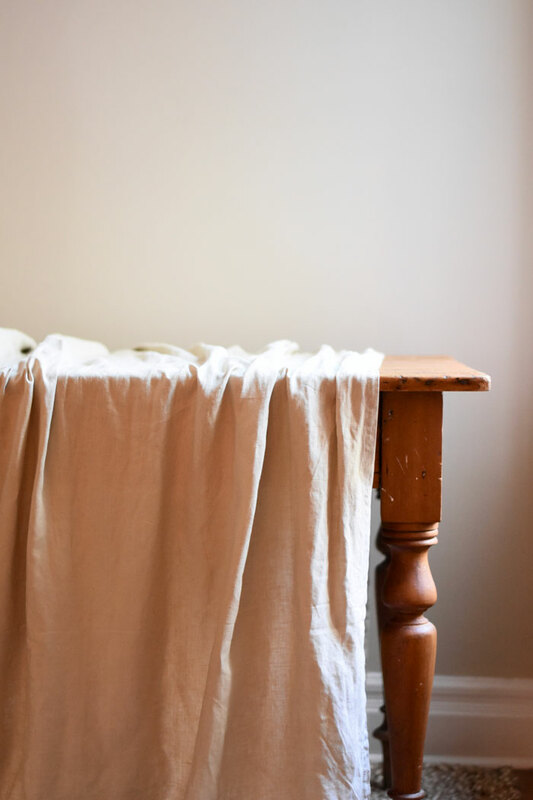 Begin with a foundation of a linen tablecloth or runner. You could also use a canvas painter’s drop cloth, a stretch of fabric or even an curtain panel. A naturally finished wooden table is beautiful on its own, but by adding a rustic linen tablecloth, your tableau is instantly elevated. The draped fabric creates a focal point and a textured background for the subsequent elements you’ll add. Leaving a portion of the wood exposed adds to the rustic, yet elegant aesthetic. 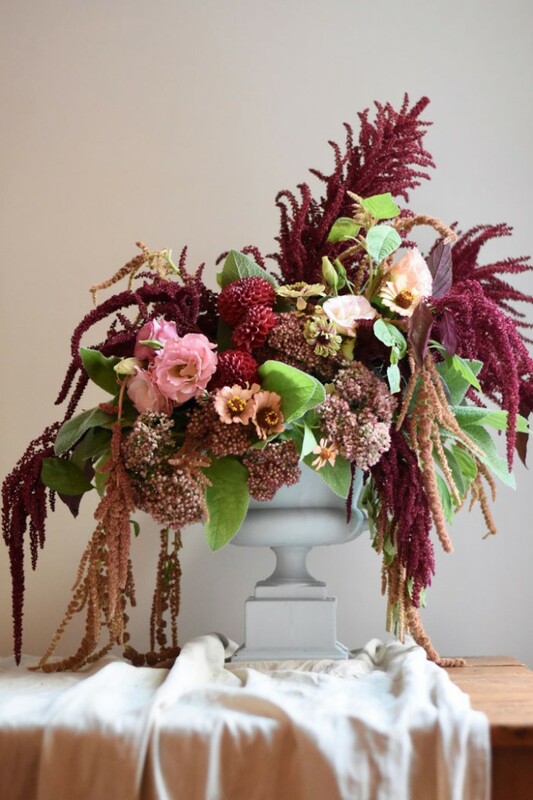 Bring in elements with different levels like this statement floral piece showcasing fall blooms of amaranth, dahlias and zinnias. You don’t want all your elements on the table at the same level, so anchor your table setting with something that lifts your eye. 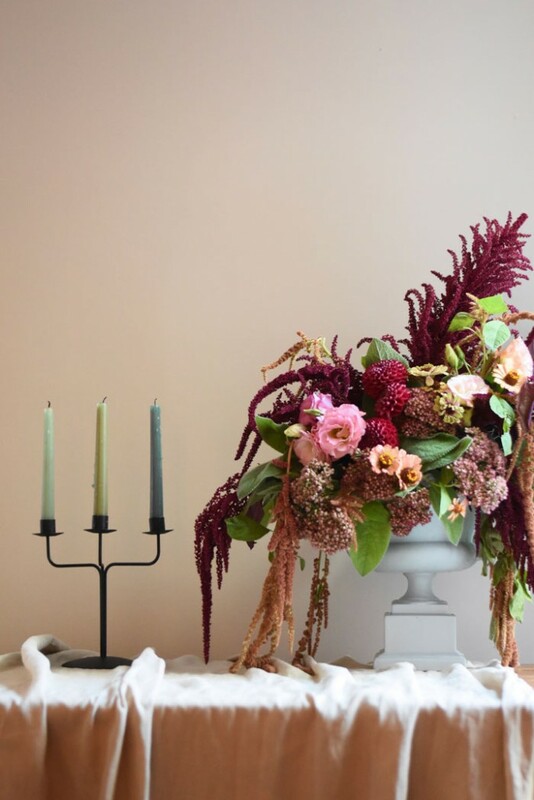 Here, we used a statement floral centerpiece to bring drama and a presence with an arrangement of fall flowers featuring amaranth, dahlias and zinnias from my garden. A tall vase with sunflowers would also be lovely or a big bunch of fall tree fall branches. If you’re interested in learning my top picks for flowers to grow for fall arrangements, check out this story on Favorite Fall Cutting Flowers. Tall taper candles add another level of interest to the tablescape and will cast a golden glow over the scene once they are lit. The pale green shade of the candlesticks and the simplicity of the candleholder are a modern take on an old-fashioned look. A simple black iron candelabra filled with tapers in the same color family adds a romantic touch to your table and casts a warm and inviting hue. Long slender candles, which are making a big design comeback, also add another level of height to the setting. Everything looks good in candlelight. A favorite place to find décor items is no further than your refrigerator. Everyday household staples like fall fruit and vegetables add a rustic country look to your table. For a simple way to add interesting shape and color to your display, raid your fridge and vegetable bins for the season’s harvest. Look for produce with interesting shape, texture and hues that fit in with your table theme. A bunch of red grapes cascading on a raised cake platter fits this rustic harvest theme. 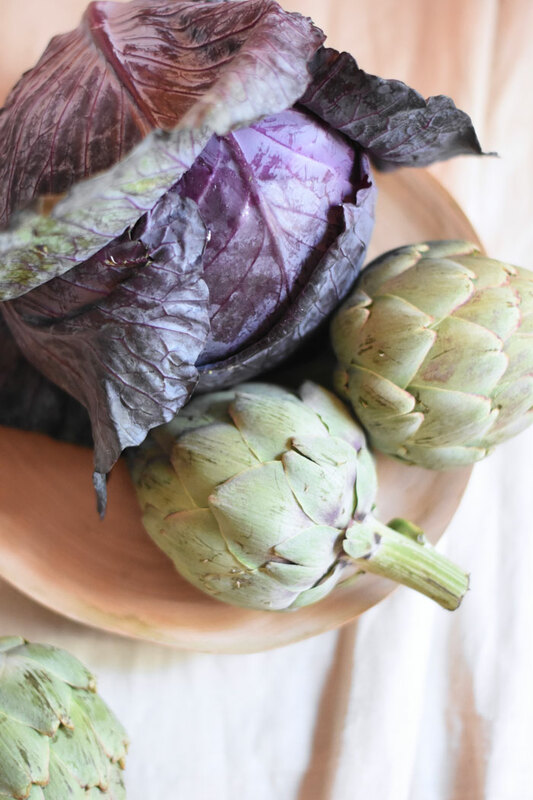 Artichokes and purple cabbage are inexpensive additions – and when they are finished being used for décor, they are delicious to eat. Artichokes and purple cabbage add texture, interesting shape and beautiful fall hues. Repeat colors and groupings for a curated and connected look across the tablescape. Mirroring colors and shapes in your table landscape creates a cohesive, curated look. The red of the grapes relates to the rich, crimson flowers in the arrangement and is also a nod to the deep color pigment of the cabbage. 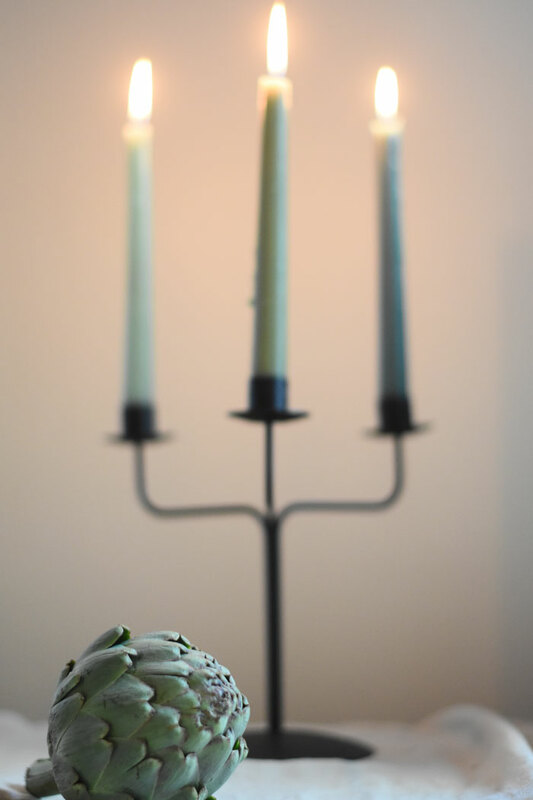 The sage green artichokes match the candles. The cream pumpkins and apricot-toned gourds complement the linen. Use the rule of threes and odd numbers in your groupings – our eyes respond favorably to this. Finally, weave in practical character pieces that are meaningful to you. The patina of old silver and chunky hotelware serving platters add heft and history to your setting. This is the time to bring out the old and well-loved favorites to add a sense of occasion, vintage charm and personality to your table. Don’t feel like everything has to match – if you keep a complimentary palette and style, it will all go together. 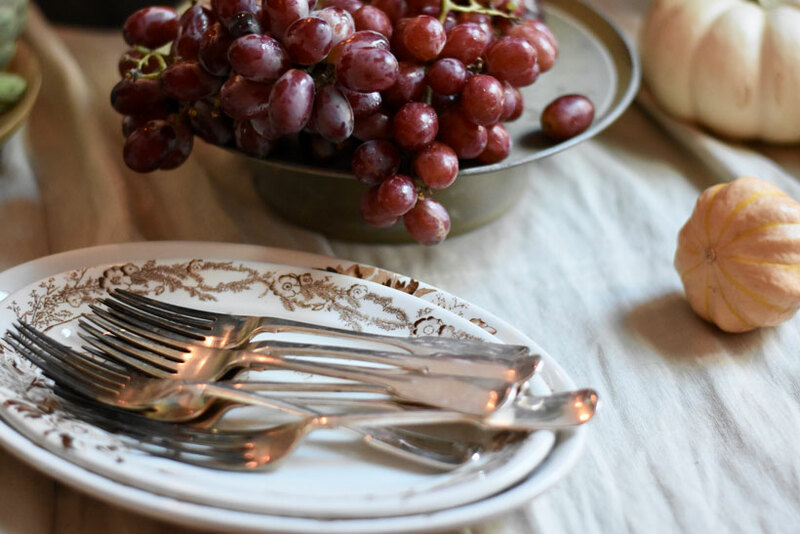 Complete the look with your vintage silverware and vintage ironstone hotelware to add rustic charm and character. 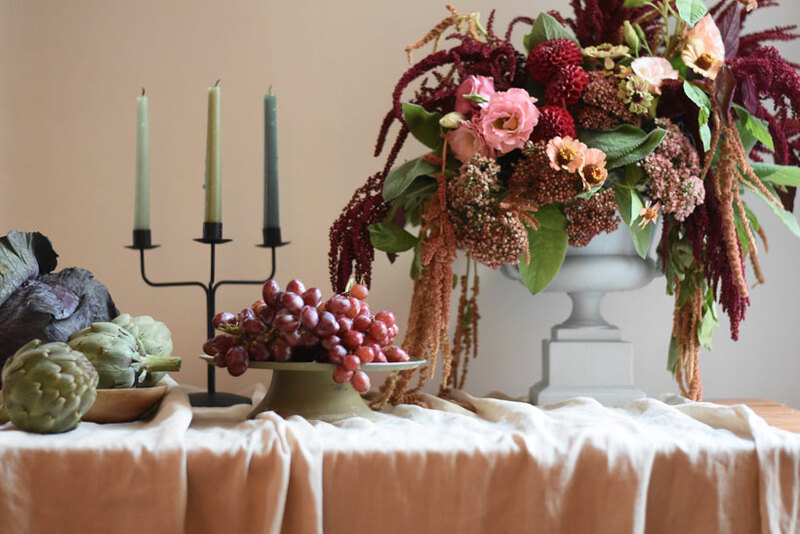 Gather around your beautifully styled harvest table and enjoy all the season has to offer. Cynthia Zamaria is a floral designer in the slow flower movement, interior designer and an experienced renovator of historic homes. You can read about her current project, the Millar House, on her website and follow her design exploits on Instagram.